Today we went out on a boat to swim with Humpback whales. On TV they show these beasts as majestic, slow moving and inquisitive chaps who like nothing better than having a human flapping about beside them. Indeed this was the speil we received as we set out to sea with the huge Capt Sam. We are briefed upon the importance of slow movements in the water, upon silence, upon respect for the whale who is letting us into their world. As we head out we start to see water spouts blowing up or a whale surging out of the water to breach so head off in pursuit and sure enough within a half an hour we are but 50 metres or so from out quarry, their large bodies gliding in and out of the water. Three times we get this close to different mothers and calves before they sink away without trace into the ocean. These huge beasts measuring 50ft long and weighing 40 tonnes disappear without trace and we are left bobbing around on the surface alone once more. After three hours we latch onto three whales – A large male, mother and baby and chug along for miles with them once more 50 metres away. The captain hopes to gain their trust by not approaching to close and that they will then stop swimming and rest long enough for us to all get in the water with them. However this group, and I suspect many others, don’t have the same idea and they continue on their way leaving Capt Sam no option but to head them off at the pass, so to speak, and puts us in front of them. Then, just like the brifing….Not! We are told to GO GO GO! Everyone runs and jumps in shouting, splashing and whooping. All eager to have that magical feeling of swimming with whales. As I hit the water I turn to face Rachel who, alone, is standing on deck of the boat that is drifting away at a fast rate of knots. Being somewhat nervous of being out of her depth she had steeled herself to get into the ocean and was quite prepared to lower herself in gently as prescribed. Running, diving and jumping however were never on the agenda and so she never got to do a drive by whale swim. For that is what it was. Had it been as seen on TV. Then she would have had every right to feel sad but as it was my whale swim lasted 6 seconds as the calf moved past me some 15 metres away. Not a sight of the other two though although there is a thirty second clip of the group that only the dive master and the first whoopers would have seen. On the way back, however, we were to stop at a reef for snorkelling and diving. I had registered for the dive and Rachel for the snorkel but since it was about two miles out to sea and I was nowhere around to help she once again viewed it from the boat in the company of a retching and very sea fellow passenger. My dive was somewhat surprisingly a sparse of schools of fish but the coral formations were the best I have seen. Still it is good to clock up the dives having now done them in the Red Sea, Thailand, Malaysia, Indonesia and now Tonga. The following day we hire a jeep. A dilapidated Rav 4 with wobbly bald wheels and no acceleration and spend two days driving around the island seeing the capital of Tonga Nuku’Alofa and the shittist Royal Palace I have ever seen; Blow holes that were pretty amazing and spurted 20 metres into the air when the waves hit the porous rock; An ancient stone Hengy style arch, swimming pigs and a brilliant cave where we had to scramble around in the dark and ended up at an underground pool where I was able to swim in total darkness in crystal clear water. A bit scary but quite thrilling. I should also mention that less than ten minutes after hiring the jeep which we were supposed to have a Tongan driving license to do we were pulled over by a large, gold tooth copper who was intent on booking us but was thankfully susceptible to our charms and humble respect. A stern warning was given with a large un-stern smile and we quickly vanished for fear of a change of heart. 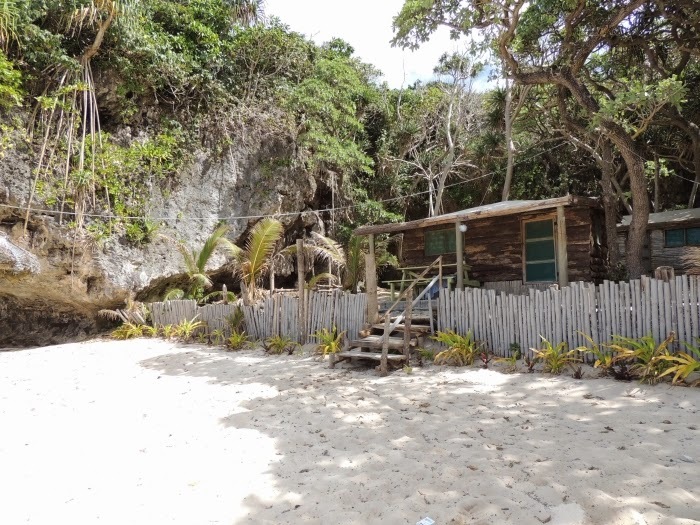 We decide to move on from our guest house and on our trek around the island find a couple of beach houses on a deserted beach that is owned by a company that puts on cultural shows. We immediately opt to spend time here even though accommodation is basic with no hot water. On the upside we have the beach to ourselves and a perfect view of the south pacific over a reef some 40 metres off the coast. Time here is slow and punctuated only by a few buffet meals where we eat raw tuna, yams, snapper, stir fried chicken, roasted piglet (displayed in all its charred glory), clams and seaweed. The shows are worth seeing. Normally we hate this tourist pap but here there are realtively few tourists and the large majority of the audience are South islanders. The host (a wannabe rock star) is an absolute showman and his staff and family look after us well and put on a mini spectacle in a flame lit cave where we see traditional dancing, battle poses like the Haka , fire and stick dances. All made better by copious wine and a short walk along the moonlit beach to bed. Tonga has proved to be an interesting break from the other places we have visited and fully justified in selling itself as the only authentic South Seas Island. We will remember Tonga for many reasons yet to be told.